Flag flying, economic recovery and the question of an Assembly opposition were all hot topics today when students from North and South Belfast quizzed their local MLAs on the issues that matter to them. The Let’s Talk style discussion was organised by the Assembly’s Education Service in conjunction with the Peace and Reconciliation Group which have held a number of similar events in the North West. Hosting the panel section of the event was the BBCs Political Editor Mark Devenport who was on hand to field questions from students and to steer the debate. As well as debating a number of topical issues, the students were able to hold in-depth talks with their local representatives through a series of round table discussions. The session ended with a mock election, where the young people discussed electoral systems and challenged traditional voting patterns. 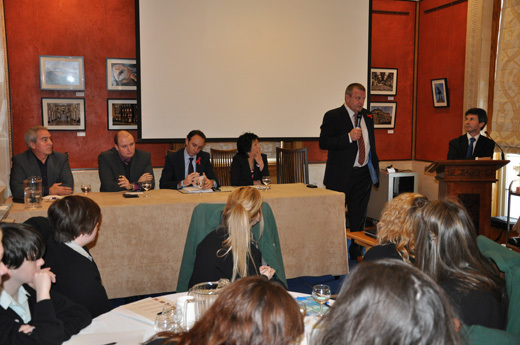 The event was a great way of stimulating an interest in politics and society and it provided an excellent opportunity for young people to put their very particular points of views across to MLAs. It was not all seriousness however and there was still time for a little fun when a student from Malone College asked the panel which one of them would last the longest in the jungle. There were plenty of suggestions – but Barry McElduff MLA was singled out as a fairly strong contender. 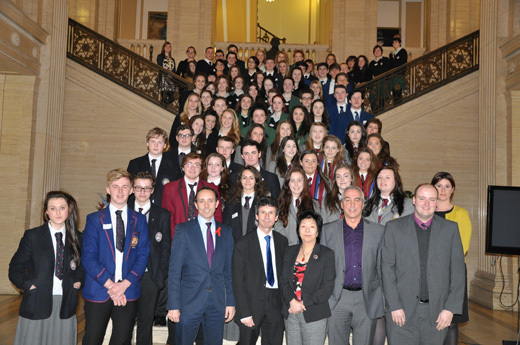 Local MLAs talk politics with Students from North and South Belfast. Pictured L-r Pat Sheehan MLA, David McIlveen MLA,Conall McDevitt MLA, Anna Lo MLA, Michael Copeland MLA and BBC Political Editor Mark Devenport. 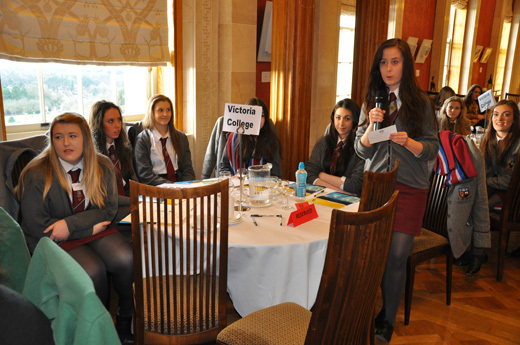 A student from Victoria College, Belfast asks her local MLAs a question while classmates look on. Students from North and South Belfast who took part in a recent "Let's Talk" event where they put questions directly to local MLAs. Pictured front row L-r are Conall McDevitt MLA, BBC Political Editor Mark Devenport, Anna Lo MLA, Pat Sheehan MLA and David McIlveen MLA.